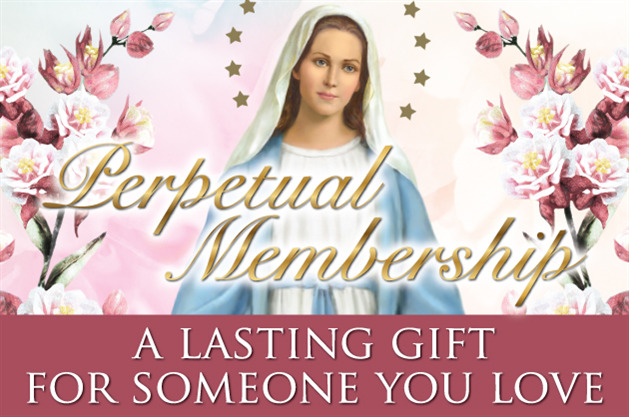 If you are looking for a way of sharing miraculous grace that comes only from our Lord in a gift for memorable occasions like Baptism, First Communion, Confirmation, weddings, and anniversaries, or for the passing of a loved, the Association recommends a Perpetual Membership. It’s an ongoing share in the spiritual benefits of Masses and prayers offered here at the National Shrine of Our Lady of the Miraculous Medal for the living or deceased. Read Fr. Kevin’s letter which explains our Perpetual Memberships and the spiritual benefits bestowed upon those enrolled.